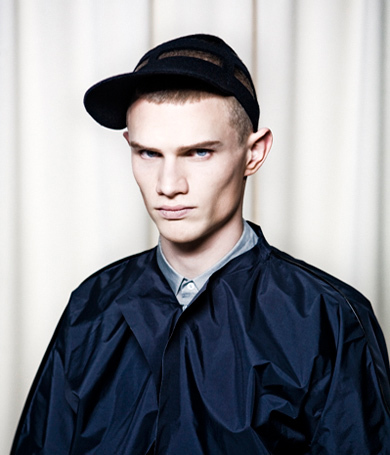 The new menswear label HEDERUS is designed by the Swedish born, 26-year-old designer Julia Hederus. The label is based in Stockholm and started up in September 2007. The autumn / winter -0809 collection is the second collection from this small and independent label. The new collection is called ”enclothes” and has it’s startingpoint in wrapped in garments. The collection consists of windproof sportjackets with no-sew details and plain zippers. There is also jackets with plisse in wool/polyester and loose pants with double drawstrings. The clothes are luxury sportswear and are created for the men of fashion today, who appreciates an unconventional cut and shape. Julia Hederus started to study menswear at the age of 20. She did her BA in menswear fashion at Kolding Design School, Denmark. Then she moved on to do a MA at Central St Martins in London 2005. The graduate collection was shown at the London Fashion Week in February 2007. HEDERUS is a futuristic and conceptual menswear label. The clothes are inspired by modern architecture and street fashion, always with a strong concept. Earlier work has been formed by inspirations such as jigsaws, Lego and box shapes. Sport and minimalism are often something present. Since the start of working with menswear, the sport influence gave more creative space when it came to create new shapes and unconventional cuts of the garments. The textiles also have great importance since she often works with hi-tech fabrics and no-sew technology. One goal has been to create garments that feel like they’re all made in one piece and founded like a plastic Lego-block.